I was once engaged to a woman with whom I was madly in love. I thought she was the most beautiful woman in the world. Her voice was like honey to me, and just her name was a magical incantation. The thought that she could love me in return – and she said she did – had me walking on the clouds. The first few months were among the happiest of my life. But then things turned sour. She became short-tempered with me, sometimes sarcastic, and often critical. She still claimed to love me, but the bad times outnumbered the good. My daughter was three years old at the time, and at times the woman was annoyed with my child and even angry. That was the last straw for me. I still loved this woman madly, but I ended the relationship for the sake of my own self-respect, and for my daughter. My point? “True love,” is NOT the foundation of a healthy relationship. That heady, intoxicating sense of romantic love is amazing and can fill you with happiness, but it’s not sustainable, and even if it can be maintained it’s not enough. Greet them kindly, show interest in their well being, ask about their day. Never compare them to anyone else. Notice the good things they do for you, and thank them for their contribution. Always be faithful. This doesn’t only mean not cheating on them, it means to be on their side, to support them through hard times, and to stick with them through thick and thin. Similarly, never demean or criticize your spouse in front of others. Do not gossip about them, mock them or put them down in public, ever. Consider your spouse’s happiness to be equal to your own (not more important than your own, but equal). Strive to make them happy. Always consult with your spouse before making important life decision that may affect both of you. Listen to your spouse’s opinions. You may not always agree and you don’t have to, but be courteous and listen with an open heart. Genuinely try to understand what your spouse is feeling. When it comes to romance, attend to your spouse’s needs as well as your own. If your spouse is not in the mood at that moment, respect that and do not push. On the other hand, try to be attentive to your spouse’s romantic signals. If you can meet their need without discomfort, do so. 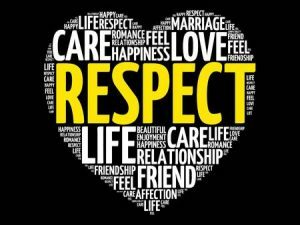 A last word about respect: of course both partners should respect each other, but it is especially important for a wife to treat her husband with respect. I say this because women and men are different. Most women want to be loved, protected, cherished, and included in the man’s inner life. Men, on the other hand, need to be respected. A woman might love a man passionately, but if she doesn’t treat him with respect he will not be happy and the relationship will not last. This is a short but to-the-point article that was posted on MuslimMatters.org about listening to your wife and giving her the attention that she deserves as your life partner. Brother Abdul-Qadir Kazeem used some clever humor to make his point. So brothers, don’t be offended! Even if you are already very considerate and “enlightened”, it never hurts to be reminded. Next we’ll have to get a reminder “for sisters only”, Insha’Allah. You are having a wonderful day. The sun is out, there is a nice breeze, and you are reading your favorite book on the porch. Nothing could possible ruin this moment. Right in your ear. A fly. Now you have to waste 5 minutes in battle with it as it tries to land in your ear over and over. You know what is interesting about this situation? The fly could have been sitting next to you for several hours, and you did not notice it until it came and buzzed in your ear. Now is when the presence of the fly matters. Stop whatever you are doing. Block out everything else. What the speaker has to say is all that matters at the moment. Make eye contact with the person to let them know you are paying attention. 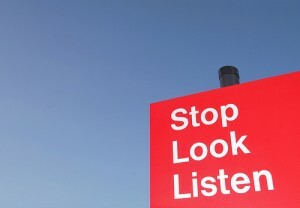 Let them know you are listening by head nods, verbal queues (yeah, uh huh), etc. This is especially true when you are in an argument with your wife. If you both insist on talking and not listening, this is a collective monologue. You are either speaking or preparing to speak, which will get you nowhere. Make it a point to sincerely listen your wife’s point of view, and repeat back some of what was said to show that you understand. This will save you time and prevent putting more strain on the relationship (She never listens to me!!! She never tries to see things my way!!!). Even if you do not get your way when there is a clash, you are more likely to be content with the result if you felt the other person listened and understood your point of view. So, my dear brothers, the next time you come home from work (I know I know, you had a hard day and you are tired), and your wife comes up to you with a big smile and starts to tell you about her wonderful day, what should you do? Stop. Look. Listen.